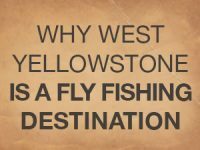 Learn about different types of flies for you West Yellowstone vacation. 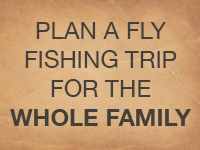 There are three basic types of flies in fly fishing, all of which imitate prey for fish. A nymph fly is fished while it is submerged below the surface of the water. Therefore nymphs are created to look like different insects that are in the immature stage of their life when they live under the water. As a result a nymph fly is usually very successful because trout eat underwater approximately 80% of the time! In addition a strike indicator is often used, because the fly is underwater and you cannot see it. Therefore an indicator is attached to your fly line and floats on the surface of the water. As a result when a fish strikes and attempts to eat your nymph, the indicator will be pulled sideways or underwater so you know when to set your hook. Streamer flies are created to look like small fish or prey that move through the water. After casting your streamer, you strip (pull) your fly line in short or long bursts so it looks like it is swimming. In addition fish usually strike streamers aggressively and with a lot of strength. A dry fly floats on top of the water. As a result a dry fly is created to look like an insect that flies through the air and is resting on the surface of the water. Hence using a dry fly makes for one of the most exciting moments in fly fishing, when you witness a fish rise to the surface to grab your fly!